He has a compelling personal story. He researches and knows his topic well. He makes things the reader knows nothing about seem both familiar and doable. He communicates with humility and honesty. He “writes about the transformative power of fermentation with such infectious enthusiasm that he makes you want to try things just to see what happens,” according to fellow evangelist Michael Pollan, himself no slouch when it comes to writing. 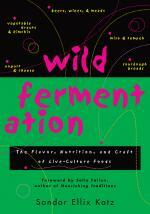 Wild Fermentation looks like a modest book at first blush. However, the number of fermentation topics it covers would be staggering and overwhelming were it not for Katz’ ability to make everything sound so darn fun, and show just how truly easy most fermentation really is. Through this book, Katz breaks down technological, technical, cultural and psychological barriers to empower his readers to experiment and integrate fermented foods into their own lives. He covers historical, philosophical and practical angles, including recipes and processes to get the reader started with their own projects. Katz does a fantastic job discussing variables (such as heat, salt, sugar content), and prepares the reader to experiment and see what works best for them. That in itself is huge. In an internet culture spreading so much fear, uncertainty and doubt (FUD), with so many people posing as experts only to scare and confuse newcomers with unfounded claims, Katz stands apart from the crowd — through his life, writing and work — as an ethical model and a timeless resource of unquestionable integrity. Wild Fermentation and its bigger (albeit younger) sibling, The Art of Fermentation (review forthcoming) bring thousands of hours and dollars of experience and expertise to their readers for pennies on the dollar. Anyone interested food will benefit, one way or another, from familiarizing themselves with the material in this book. This includes people who just enjoy reading about food (the Michael Pollans of the world; although they’ll probably want to start experimenting), as well those of us who enjoy preparing food from scratch. More specifically, live-culture food and fermentation hobbyists of all types and fermentation enthusiasts and professionals alike should read the book purely on the basis that it has had such a massive impact on the revival of interest in food fermentation in the United States, and for good reason. Wild Fermentation presents few, if any pitfalls, making it easy to recommend wholeheartedly as an introductory and foundational text in an evolving and expanding field. Read the book itself straight through the first time as a sort of well-written and interesting fermentation travelogue. Then go back and use it for inspiration and recipes, over and over again. Katz presents a wealth of cultural information in a very concise and compelling manner, then backs up each fermentation topic with all sorts of recipes that show how quickly variations on a basic theme can lend diversity to the topic. For local (Willamette Valley) residents: Please buy the book from (and support) The Book Bin. If you read this review and are non-local, please ask your local bookstore before purchasing online. If you do purchase online, we ask that you purchase Wild Fermentation through us directly using the link on the sidebar to the right of this article. Doing so directly supports Saueressen, the publisher and the author. Thank you! This entry was posted in Knowledge, Making Ferments and tagged Michael Pollan, Sandor Katz, Sandorkraut, The Art of Fermentation, Wild Fermentation on November 12, 2014 by ozob. Personal consumer tool: People want more transparency in their food (they want to know what eat, where it comes from and how it’s made; which means they want to feel good or at least OK about what they eat). They want to make it easier to avoid GMOs without necessarily having to buy organic, for all sorts of reasons. Political economic tool: Additionally, labeling foods containing GMOs creates opportunity to put consumer pressure on producers to use non-GMO ingredients. In other words, the law “lets the market decide” whether and to what extent it will accommodate GMOs. So far, the opposition has grossly inflated how much the law would cost to consumers (est. $2.30 annually). The rest of the opposition’s arguments seem to base themselves in some sort of fear that labeling will decrease market demand for GMOs, which they consider a bad thing (mostly because it harms corporate profit or they believe a world without GMOs threatens food security). Which Genetic Engineering? There are many — which of them does the law address? Which Agriculture? Industrial monocultures do not require GMOs and can be organic — does that make them acceptable? Saueressen maintains a position that GMOs exist at their worst as symptoms of those deeper issues. Further more, the underlying issues will persevere and progress until we bring them to the surface or dive in after and figure out exactly what we consider problems if we want a chance at implementing effective solutions. This paper constitutes Saueressen’s effort to contribute to that pathway forward vis-a-vis its own food security-based mission and operating philosophy. Do we oppose or support genetic engineering, corporate control of food systems, neither, or both? I feel very fortunate to have recently discoverd and read a fantastic National Geographic (NG) article on the future of farming and food security in relation to genetic engineering and agro-ecological (including but not limited to organic) practices. The article clears up many of the points of confusion in the GMO debate, which I greatly appreciated. I also felt it also gave sufficient weight to the importance of investing in agroecology as a foundational technology for food security and environmental restoration. The confusion around genetic engineering and corporate control begs an important question: Can we have the one without the other? if so, how? If not, why not? The IRRI is not Monsanto. It has no private shareholders or profit incentive. It does not seek to control seed and food supplies for profit. Does a world without Monsanto still need organizations like the IRRI? The IRRI uses genetic engineering as one of many tools to fulfill a mission that most people might have a difficult time finding fault with. Corporations use GMOs as a tool to monopolize control of nature and food. Consider that proprietary, patented seeds now make up 82% of all commercial seed transactions, and the ten largest global corporations own 67% of all those patents, or 55% of all commercial seed (source: ETC Group; local copy here). However, corporate patents extend beyond GMOs into non-engineered wild and domesticated species. LIkewise, not all GMOs exist as proprietary corporate property. Addressing GMOs in our food supply does little to address corporate control of food and nature, since GMOs represent merely one of many different tools of control that corporations use. Banning GMOs to quell corporate control is like banning spoons because a “spoon gang” appeared around town weilding spoons as weapons to harm other people. Let’s address the gang behavior. If we make decisions about our food through our democracy, then we must also address the corporate control of our political system itself. Take, for instance, the spending breakdown on Measure 92: The opposition spending comes form 100% large corporate, out-of-state sources. But most of the support spending comes from out of state sources as well (albeit a healthier mix of individuals, non-profit and corporate donations). This means that Oregonians — the primary stakeholders — play at best a marginal role in framing and discussing the issue at hand. I find that disturbing. The issue here isn’t so much whether to accept or reject genetic engineering, but who gets to make that decision, and under what terms? Now consider that Oregon Community Rights Network addresses this question directly by empowering communities with tools and resources to define and sieze democratic control of their health, safety and welfare — including their food systems. The Community RIghts movement accomplishes much more than any labeling law ever will, using a fraction of the financial resources, to address problems at their root. It deserves at least as much support as this labeling law. Issue 2: Which genetic engineering? So, is the tool itself — genetic engineering — faulty? In order to determine whether we support or oppose genetic engineering itself, or let alone determine whether it can occur without corporate control of our food, we need to understand the range of genetic tools in use to produce new varieties and species. Fortunately, the aforementioned article does a fantastic job introducing those tools to the reader. Marker-assisted selection: Combines traditional breeding and hybridization techniques with genetic engineering to identify relevant genes or introduce markers. Breeders may engineer plants to “knock out” certain genes until they find the relevant ones they wish to manipulate through a breeding process. Then they can use markers to determine whether the breeding process succeeded, saving time and money. Results in a faster breeding process, makes use of existing biological diversity (no new genes or proteins). Mutation breeding: Mutations happen naturally over time. We speed the process up by deliberately exposing seeds to chemicals or (more often) radiation (think: X-rays and gamma rays, like Bruce Banner and Incredible Hulk!) and seeing what results, using conventional breeding to create the new variety or species. We’ve been introducing potentially novel genes and proteins into ecosystems and our food supply this way since the 1930s. Transgenic engineering: This is the newest form of genetic engineering, which introduces genes from unrelated species into a second host species, followed by conventional breeding to develop the new variety or species. When we talk about genetic engineering and GMOs, we most often mean transgenic engineering. It resembles the natural process of endosymbiosis (aka symbiogenesis, aka cooperative evolution), but again, in an accelerated form. I actually see this as less problematic than mutation breeding in some ways, because at least we’re dealing with DNA and proteins that already exist in some way, shape or form in our environment. So, which genetic engineering tools does the proposed Oregon labeling law cover? The law definitely targets transgenic foods for labeling. I can’t suss whether the law covers mutation breeding. If it doesn’t, it probably should, even for the sake of consistency. I honestly can’t tell whether the law affects marker-assisted selection, since that process can involve messing with the genes of plants. I would love for someone with authoritative knowledge to help answer this question. I could not find any discussion on this question, which seems of central importance to the GMO debate itself. Issue 3: The Need for Speed? Savvy readers may have noticed a theme with the above-mentioned genetic engineering tools: accelerated results. In the discourse on our food systems, so much of what we read falls into a “race against time” narrative. We need to produce more food, faster. We need better varieties, sooner. Quick quick quick. The narrative takes for granted that our food-related problems are problems of production. They are not. They are problems, first and foremost, of distribution, profiteering, and power (ref. Issue 1: corporate control of food, above). The narrative takes population growth as a given, rather than seeing how reducing gender discrimination (education, economic opportunity, social standing, reproductive control), for example, can slow or even reverse population growth and therefore slow the growth in demand for food, create new resources and better distribute available resources. So really, there is no inherent reason for us to single-mindedly focus on faster, bigger, better production and breeding. Which is good, because safe change takes time, as does proper longitudinal (read: long-term) safety testing. While we take the time to assess and adapt to the changes we’ve made, we can allocate resources more appropriately toward developing small-scale, decentralized, diversified and resilient food systems. We can move food security ahead in leaps and bounds if we allocate even a small fraction of the $24 million spent on arguing over GMOs in Oregon toward efforts that really matter, such as women’s empowerment and small farms development grants, community rights and other resources. Let’s let that sink in: We don’t breed our food for taste, nutrition and resilience, first and foremost. We breed it for economic performance. As a result, we’ve taken a lot of easy shortcuts that have ironically made the road ahead of us much longer and more difficult than it needs to be. MIchael Pollan, for example, reminds us in his discussion of the history of the apple that the selection of crops for industrial-scale monocultural production generally causes a dramatic loss of genetic diversity that requires increasing inputs of pesticides and fertilizers. What will it take to rebuild the nutritional value and diversity of our food systems? More organic production? Big Business loves organic, creating what Michael Pollan calls Organic-Industrial Complex. Have you ever seen an industrial-scale organic farm or feedlot? It looks more like our worst genetically-engineered nightmares than like the friendly local family farms we idealize. Saueressen urges people to support local family farms before they support industrial organic farms, even if the family farms aren’t certified “organic” (many already use organic practices as a matter of course). Industrialization, monoculture and corporate control all predate GMOs, and these issues will continue until we address them directly. In this sense, Measure 92 represents the latest in a game of “whack-a-mole.” The community rights movement argues that maybe it’s time to stop playing the game and just unplug the industrial machine at its source. Saueressen supports that position. Food systems predict and shape a society’s structure, and therefore can create or solve many societal problems. We can improve all aspects of our quality of life by changing the way we produce and distribute our food to mimic the complexity of productive and healthy ecosystems. We need to start de-emphasizing industrial monocultural methods and emphasizing permacultural and other agroecological approaches that enhance our food production while healing the earth at the same time. if we put even a small fraction of resources that we contribute to genetics and the politics around it into permacultural techniques, small farms, community rights and the empowerment of women, we would see global food security improve in leaps and bounds. Since the first green revolution, says Robert Zeigler, ecological science has advanced along with genetics. IRRI uses those advances too. “In the early ’90s you didn’t see birds here. The pesticides we used killed the birds and snails and everything else. Then we invested a lot to understand the ecological structures of rice paddies. You have these complex webs, and if you disrupt them, you have pest outbreaks. We learned that in the vast majority of cases, you don’t need pesticides. Rice is a tough plant. You can build resistance into it. We now have a rich ecology here, and our yields haven’t dropped. remember to see the forest through the trees and continue the fight past the ballot box. At stake is a food culture war, of sorts, between two competing philosophies that differently prioritize food security and profit. When corporations like Monsanto prioritize profit above all else — as an end in itself rather than a means to a greater end — food security comes second at best and sometimes even suffers. We need more organizations who make profit a means to a greater end in all aspects of our society. We need holistic, multi-faceted solutions to the global food crisis. It sounds like the IRRI understands that point. I’d take that over Monsanto any day, even if it does include a smidgeon of genetic engineering. Saueressen embodies this ethic by using profit to support artisans who lovingly create hand-crafted live-culture foods so they can give back to the community that sustains their craft and help build a more food secure future for us all. Join the community rights movement to dismantle corporate corruption of democracy by helping out or starting a local chapter. In Oregon, Lane County and Benton County are leading the way by establishing Food Bills of Rights in their communities, with several other counties close behind. Let us know if you have any questions or thoughts! This entry was posted in Announcements, Knowledge and tagged Breeding the Nutrition out of Our Food, CELDF, Food Bill of Rights, Food First, Geoff Lawton, Greening the Desert, IRRI, Jo Robinson, Michael Pollan, Monsanto, National Geographic, New York Times, Oregon Community Rights Network, Oregon Right to Know, Oregonian, Organic-Industrial Complex, our daily bread, Pattern Literacy, Robert Ziegler, The Second Green Revolution, Toby Hemenway, whole living, Yes on 92 on October 25, 2014 by ozob.